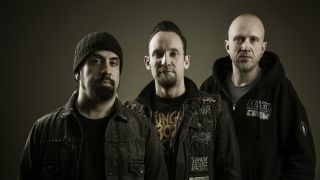 Volbeat describe the birth of their track The Devil’s Bleeding Crown in a new behind-the-scenes video. The Danish rockers released a lyric video for the track this month and in a new clip they explain how they played the song to live audiences to gauge reaction before committing to recording it for upcoming sixth album Seal The Deal & Let’s Boogie. Drummer Jon Larsen adds: “It’s a typical Volbeat track. I guess you could almost call it our signature sound. Poulsen explains that the band only played half the track for North American audiences, saving the whole track for crowds in Denmark as a treat for local fans. Volbeat have a string of tour dates lined up for 2016.